This past semester I have been participating in a Theology and Science seminar at Fuller Theological Seminary in Pasadena, CA. The seminar comes at a time of transition for me. I am working, preparing for my new doctoral programme in Cultural Studies at Claremont Graduate University, attempting to finish an initial reading list for my first semester of research for my PhD at Nottingham and finishing a paper I am giving at the University of Bielsko-Biala, in Poland at the end of June. With so much going on I have worried that my capacity for attentiveness might be somewhat diminished with regard to the seminar. I have found, rather, that the seminar has coincided well with the material I have been engaging elsewhere, albeit a very critical coincident. Some point of obvious contention have included certain statement made by those on the theological end. “Quantum theory says ‘this’ so then we may speak of divine action like ‘that'” etc. There is an entire apologetic posture built into those types of questions that I don’t think I really need to expound but really only need to state in order for its fallacious nature to be obvious. However, I was assigned a brief presentation with another student on John Hick’s book Evil and the God of Love. The point of the assignment, with regard to its relation to the particular variant of the science-theology dialogue that the class engages, is to approach the topic of theodicy in light of what science purportedly has to say or do. 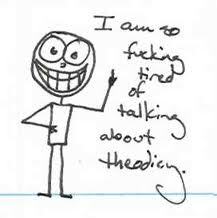 Specifically, I was tasked with responding to Hick’s argument for an “Irenaean approach” to theodicy. Hick argues that contrary to an Augustinian narrative of sin, where there is a historically and ontologically verifiable original state of humanity from which the species falls in sin, that Irenaeus provides a way of thinking humanity, evil and God that both takes evil serious as real, unlike Augustine’s privation, while preserving the transcendent categories for God and Being. What follows is my response that I will present tomorrow, which I have above characterised at a transition toward Immanence. In part this is due to how I take Hick to misrepresent Spinoza, and the entire idea of monism. However, also see this response as an outworking of a larger transition toward figuring out how the work in my MA on critical pedagogy and personhood relate to a deeper recognition of what it means to think in an immanent frame. Here I wish set Hick’s descriptive account of the Irenaean approach into dialogue with an earlier section of the book in which Hick attempts to describe two other approaches, which he deems incompatible with Christian faith. The polar schematic Hick draws pits a monist ontology on the one end of the spectrum, what I will refer to here as an ontology of “immanence,” and dualist ontology on the other end. Our focus for this reflection is upon the monist paradigm. The purpose for such a move on my part is to provide the context from which to inquire into Hick’s understanding of the goal of theodicy, and by extension, the legitimacy of such an endeavor in itself. In short, I wish to question whether Hick’s nuanced attempt to bring about an eschatological resolution to the problems that plague other projects in theodicy actually accomplishes its goal. This line of questioning serves the larger purpose of getting us to the more basic question at work in Hick’s text, namely, whether or not the sought after goal of his theodicy is legitimate. Toward this end, I wish to argue that what Hick says he wants in the text, set against what his work discloses with regard to his desires, is contradictory. Hick wants a rejection of an original state of perfection. Yet, he also needs to retain some sense of an incompleteness of the present in order for his interest in constructing a theodicy to remain intelligible. There is a certain type of rhetorical game that Hick plays at this point in recourse to Irenaeus, (i.e. the notion of ‘maturing’ vs. the Augustinian idea of moving from innate damnation to salvation in Christ). Yet, we must press Hick to differentiate further how this rhetorical move functions any differently than the move Augustine makes. I contend, with regard to function, that the logic is the same as the Augustinian. Any form of a redemptive eschatological goal that regards the present as somehow wanting in content, necessitating something other than the immanently real, ultimately devalues the present. Ironically, Hick will proceed to charge Spinoza, one of the great thinkers of immanence, with failing to take the immanent reality of evil seriously, while still making use of the aforementioned model. I want to assert along these lines that Hick’s desire for an eradication of the perfect original state of humanity conflicts with how he wants to recognise the reality of evil in theological categories. Indeed, I want to so far to ask whether or not, in light of his use of modern theology, he maintains his proposal for dogmatic and not speculatively honest, reasons? Hick’s desires obfuscate the primary value that he highlights in his recovery of an Irenaean theodicy through Schleiermacher, namely, the primacy of an immanently human framework from which to make intelligible statements about evil and suffering. On this basis, Hick thinks he is rejecting the monist ontology, and by extension of his critique of any privation theory of evil, he is able to already cast doubt upon the Augustinian legacy. However, this charge against Spinoza is curious since, in the first instance, the reading is questionable, and in the second instance, any attempt to frame evil outside of the parameters of a sheerly given experience already forces one to condition the experience beyond what is phenomenologically given, creating distance from whatever evil is as experienced. Is it not rather the case that in attempting to look at evil and suffering within the parameters of an immanent frame that one avoids such conditioning? Hick, having dismissed the monist proposal outright, then, misunderstands the ramifications of Spinoza’s ontology for theological discourse, and as a result, fails to incorporate immanence into his own project as a viable way to understand issues of evil and suffering. I find this misreading unfortunate for our current discussion since it seems to expose one of the more basic tensions at play in our discussion of how science and theology can speak to each other. Attempting to take experience as real and describe it accurately without the need to qualify it in any categories outside of itself appears the methodological site of struggle between the scientist and theologian. Some questions for further consideration: Is the point of theodicy to really make evil less dreadful? What does this sort of statement reveal pedagogically about the difference in posture between the theologian and scientist? Is there room for an honest inquiry on the part of the theologian who seeks to ask questions related to theodicy if, for maintenance of theological identity, one has to condition, or qualify, experiences? This is one of the more directly fallacious associations Hick attributes to Spinoza. While the language appears similar with regard to evil not ‘being’ in a positively ontological sense, the association fails to seriously consider the difference the Augustinian narrative of a necessary salvation makes for framing privation. Privation only makes sense if there is a prescriptive order to the world, in which one can participate either fully or partially. For Spinoza, the statement of necessary order is not in any prescriptive sense but rather a phenomenological reality, the world just is and this includes the spectrum of human desires, feelings, etc. For Spinoza, then, there is no true privation of evil but rather an acknowledgment that evil and suffering function along a definitional horizon that is always in-flux, much the same way we now understand sexual desire to function. Barber, D.C., On Diaspora: Christianity, religion and secularity. 2011, Eugene, Or. Cascade Books. p. 27. Barber writes, “Immanence, ontologically speaking, names a reality that rejects any transcendent beyond, but it does so from a point prior to the distinction between a beyond and a below. What immanence defends, in other words, must not be defined by a prior relation to the beyond.” (Italics are mine). Hick comes close to realizing this outright when he affirms Schleiermacher’s project of eradicating the original state of perfection. “This is accordingly not a doctrine of the original perfection of the world in the sense of a harmonious primordial condition…The perfection of the world, in virtue of which the God-consciousness can occur within it, still exists; it is ‘original’ in the non-temporal sense of being fundamental and constitutive (221).” Hick appears to favour the use of ‘original’ as merely descriptive in nature of something innately given to human experience. In this regard though, Schleiermacher is much close to Spinoza than any explicitly Christian formulation insofar as such a theological conviction is not need for the affirmation of Schleiermacher’s position. This is not a conditional definition but rather a phenomenological description. Barber. On Diaspora. pp. 26-27. Barber illustrates my point in relation to understanding Spinoza’s notion of immanence and what this means for theological discourse, including theodicy. Immanence is unitary; it is ‘immanent’ to nothing and contingent upon only itself. In this sense, Hick’s description of monism is only partly wrong, his utilization of ‘harmonious’ to summarises Spinoza’s point being the target of my criticism on this point. Spinoza struggles with naming immanence, calling it dually ‘nature’ and ‘God.’ Barber picks up on this necessary act of naming in such a way that one asserts two difference names at once. He writes, “Spinoza thus serves as an excellent exemplar of the approach I am advancing, one in which the opposition of immanence to transcendence requires not the rejection of theological discourse’s signification, but on the contrary a new expression of it.” Theology, Christian theology included, is not necessarily against the monist but is required for the monist insofar as it expresses something necessary for stating the sheer thereness of the world as one substance.